What Bilbo perhaps misses is that he (and the reader) was captured in much the same way. Faced with a mass of dwarves, Bilbo would certainly have not tolerated the 'unexpected party'; but a few at a time was more difficult, and he, like Beorn, only gradually learned the actual number. Likewise, we (like the dwarves) only gradually learn the potential of the hobbit; and in part by the sharp contrast between his relative helplessness in the episode of the trolls (Chapter 2) and his bravery in the episode of the spiders (Chapter 8) or his resourcefulness in the hall of the Elvenking (Chapter 9). But a tale of only symmetries is bland, and I think one of the most brilliant moves of the book is that the tale leads us to think of Smaug and his treasure as the goal of the whole journey -- although it did warn us here and there that things were perhaps not so simple -- but then shows us that this could not actually be it at all. The dwarves thought as far as the treasure; they had no clear plan for dealing with Smaug; and beyond that, nothing. But Tolkien recognizes that the actual target of the tale cannot be the dragon in the Mountain but what happens after. A formulaic writer would not lead Bilbo and the dwarves to Smaug just to have Smaug slain by Bard -- true, that was made possible by Bilbo and the dwarves, but it is a diversion of the apparent goal of the story that would not be commonly found elsewhere. But the move, allowing the Battle of the Five Armies rather than the death of Smaug to take the climactic height, is a vast improvement. It gives the book an epic feel; but also, and equally important, it makes the return to the Shire possible. Bilbo has become very resourceful -- but against the backdrop of the Battle, we see, as Gandalf says, that he is "only quite a little fellow in a wide world after all!" (p. 303). I had intended to look a bit more closely this reading at the influence of Beowulf on the work; Tolkien notes elsewhere that Beowulf was not consciously on his mind, but also recognizes that, while the story grew on its own principles, Beowulf was certainly an influence on features of it. But in fact the story sped by so smoothly that I never really got around to it. And that, I think, is a sign of quality all of its own. Then Bard drew his bow-string to his ear. The dragon was circling back, flying low, and as he came the moon rose above the eastern shore and silvered his great wings. J. R. R. Tolkien, The Hobbit, Ballantine (New York: 1989). In virtue of this sovereignty over languages and letters, the free peoples must also be masters of their laws, for they impose on the laws the senses in which they constrain the powerful to observe them, even against their will.... It is naturally not in the power of monarchs to deprive the people of this sovereignty, but, in virtue of this very inalienable nature of human civil affairs, such sovereignty, inseparable from the people, contributes largely to the power of the monarchs, for they may issue their royal laws, which the nobles must accept, according to the senses that their peoples give to them. This is an excellent point, and a fruitful one. It explains one of the major mechanisms by which customary law works and also why, in any society that is significantly democratic in intent, so much of politics inevitably becomes a struggle over language, as well as the point explicitly noted by Vico, why populism and monarchy tend to march together. And notice that every modal, if it is true, is a necessary proposition and has eternal truth because it applies the mode due the proposition's truth arising from an intrinsic connection. For example, if you said, For Peter to run is contingent, this is a necessary proposition itself, since contingency necessarily fits Peter's running. And from this you see how the First Cause is able to cause freedom and contingency in us while acting infallibly, because the First Cause not only causes the things themselves, but their modes also, and gives to each its own mode. And thus it does not follow from divine causality, for example, that Peter's walking is necessary; rather it is infallible and necessary that Peter's walking becomes so freely and contingently; for freedom and contingency fit this walking intrinsically and necessarily. [John of St. Thomas, Outlines of Formal Logic, Wade, tr., Marquette University Press (Madison, WI: 1955) p. 94.] There are some interesting complexities, I think, with taking every true proposition with an alethically modal predicate to be necessarily true. Once you start looking, it's easy to see that aesthetics (the area of philosophy concerned with art and beauty) is fundamental to understanding the world of The Hobbit and the views of its creator. Whether it's the magical map Gandalf gives Thorin, Gollum's clever riddles in the dark, the ring of power Bilbo finds, the artistic way Gandalf weaves his story for Beorn, or the peerless beauty of the Arkenstone of Thrain, the arts are continually a key feature in the story. Works of art are to The Hobbit what surveillance gadgets and secret documents are to spy movies: integral elements that drive the plot. The story of The Hobbit is a journey through a world of craftsmanship, artifacts, and artistry. Since then Benevolence, or Virtue in any Agent, is as M/A, or as in (M+1)/A, and no Being can act above his natural Ability; must be the Perfection of Virtue where M=A, or when the Being acts to the utmost of his Power for the publick Good; and hence the Perfection of Virtue in this Case, or M/A, is as Unity. And this may shew us the only Foundation for the boasting of the Stoicks, "That a Creature suppos'd Innocent, by pursuing Virtue with his utmost Power, may in Virtue equal the Gods." For in their Case, if [A] or the Ability be Infinite, unless [M] or the Good to be produc'd in the whole, be so too, the Virtue is not absolutely perfect; and the Quotient can never surmount Unity. You must always be drunk. That is it: it is the only point. In order not to feel the horrible burden of Time that breaks your shoulders and bends you to the earth, you must make yourself drunk without pause. But of what? Of wine, of poetry, or of virtue, as you please. But make yourself drunk. And if sometimes, on the steps of a palace, on the green grass of a ditch, in the dreary solitude of your room, you awaken, drunkenness already lessened or lost, ask of the wind, of the wave, of the star, of the bird, of the clock, of all that flies, of all that groans, of all that rolls, of all that sings, of all that speaks, ask what the hour is, and the wind, the wave, the star, the bird, the clock, will answer you: "It is the hour of getting drunk! In order not to be the martyred slaves of Time, make yourself drunk; make yourself drunk without cease! Of wine, of poetry, or of virtue, as you please." A rough translation by myself. The original French, for those interested. You can tell it's July. a step, a step, a step, then one is slain. are useless till the sunlight dims. the golden sun with palace-ease. in laze beneath the summer sun. to step outside, the sun to bear. 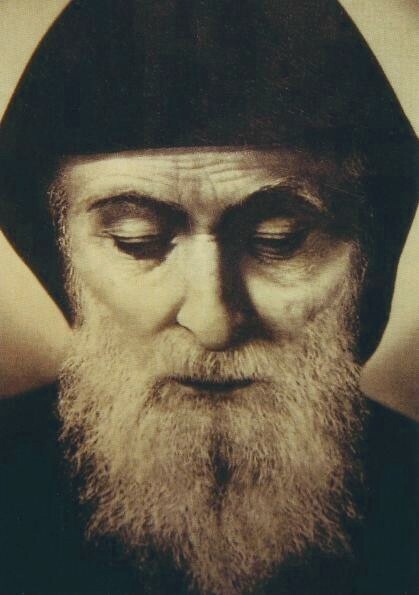 Today is the feast of St. Sharbel Makhlouf, or Charbel, monk, priest, and hermit of Lebanon. and burns but is not burned. How many a lonely wanderer has stood! Of social scenes, from which he wept to part! The World his country, and his God his guide.